To add variety to our menu, instead of chicken feet soup, I made pig feet soup. I was planning to make oxtail soup but the packages at the store were just too big for two people. 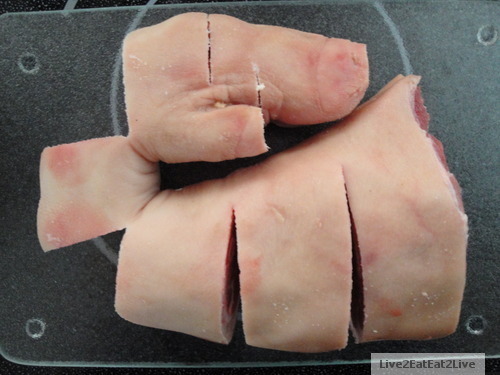 The package of pig feet was just one foot, just enough to make soup for a few days (I think I bought a forefoot). For this version, I added kombu (Japanese seaweed), Chinese dried red dates, dried mushrooms, and raw peanuts to the pig foot to simmer for several hours. I usually add mustard cabbage before serving. 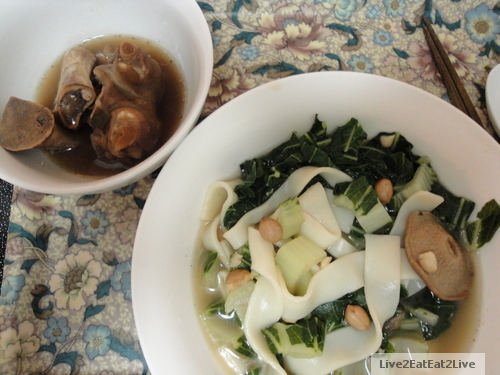 This time, the market didn’t have mustard cabbage, so I substituted Chinese white stemmed cabbage. The second night, I used chow fun noodles from our local noodle factory. Ignore the typo on the package. 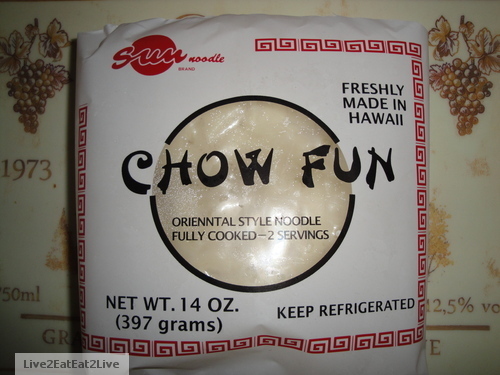 Given a choice, The Cat prefers chow fun (look fun) noodles over other types of noodles. We often have at least one package in the freezer. The soup bones are served separately so as not to interfere with the slurping of noodles. As mentioned in a previous post, The Cat loves eating the marrow from bones. The last night, I was able to find mustard cabbage. By now, most of the bones have had their marrow, cartilage, and tendons sucked clean by The Cat. I will be submitting this post to Deb at Kahakai Kitchen for her Souper Sunday feature (http://kahakaikitchen.blogspot.com/). Our menu is often dictated by what I find at the market. This week, at our Japanese wholesale market, they had beef shanks that were marked down (the expiration date was the next day). If at all possible, we try to use meat as soon as possible (especially if we purchase it marked down). I decided to make what The Cat calls “Russian” soup. The basics for The Cat’s “Russian” soup is beef stock and tomatoes. Optional additions include carrots, onions, potatoes, and head cabbage. I had onions, carrots, and a can of diced tomatoes in our refrigerator and pantry. After sauteing the onion, I added the beef shank, and water to cover. I set the stove to low heat and covered the pot to simmer. After about two-and-a-half hours, I added the cut carrot. After another hour, I added the can of diced tomatoes. Just before serving, I added salt to taste. To complete the meal, I stir-fried mustard greens and steamed rice. The Cat rated the soup as four paws (excellent!). The first thing she went for was the marrow in the bone (if you haven’t figured it out by now, The Cat loves to eat the stuff off of bones: marrow, tendons, and cartilage over actual meat. My soup almost erased the memory of eating at the “French” restaurant in Shanghai. This post is being sent to Deb at her Kahakai Kitchen blog (http://kahakaikitchen.blogspot.com/) for her Souper Sunday feature. One of The Cat’s pet peeves about living here is the lack of variety in vegetables. She misses the seasonal vegetables that she used to eat back home. One of the vegetables is shan yao. 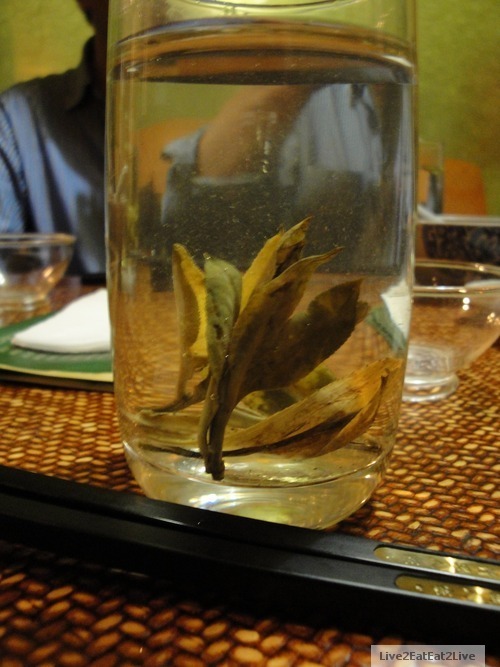 She translated shan yao as “mountain herb” but was not able to describe it clearly. She said its a very healthy food. 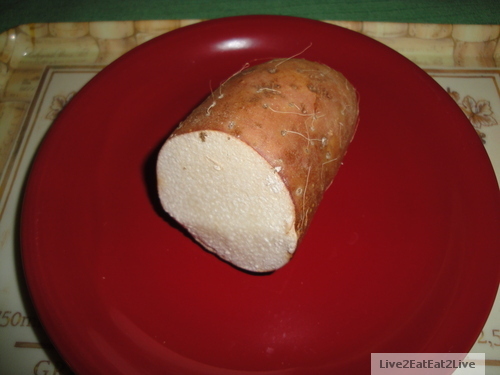 This year, since we were visiting Shanghai in the spring, shan yao would be in season. On one of our first nights there, we ordered a mixed vegetable stir fry that included shan yao. 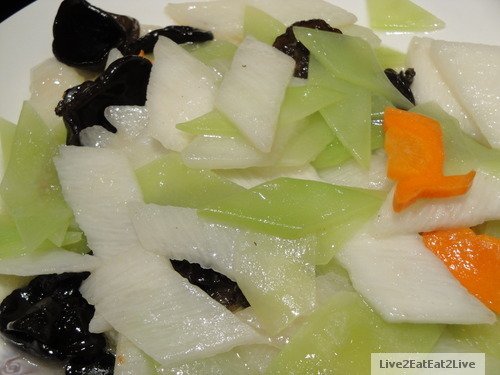 The shan yao is the white slices of vegetable. When we returned. I did a search over the internet and realized that shan yao and realized that shan yao and the Japanese yamaimo are one and the same. Here’s the Wikipedia link: http://en.wikipedia.org/wiki/Dioscorea_opposita. In the past, I’ve only had yamaimo grated into udon noodles so I didn’t connect shan yao to yamaimo. The stir-fried shan yao did not have the sticky, gooey, and slimey texture I normally associate with the grated yamaimo. The other day, I found yamaimo at our local Japanese membership store. Because it is so expensive (between $7 and $8 per pound), I only bought about half a pound. I was able to stretch the shan yao for two nights. 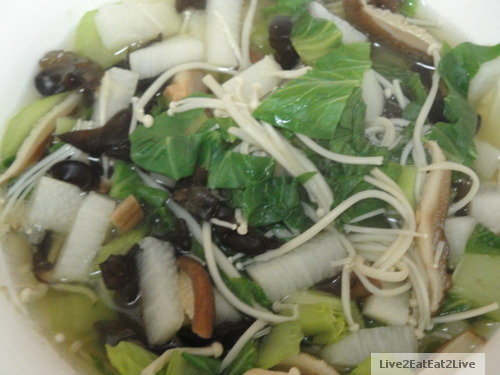 I combined it with Shanghai cabbage, black fungus, dried mushrooms, and Enoki mushrooms. 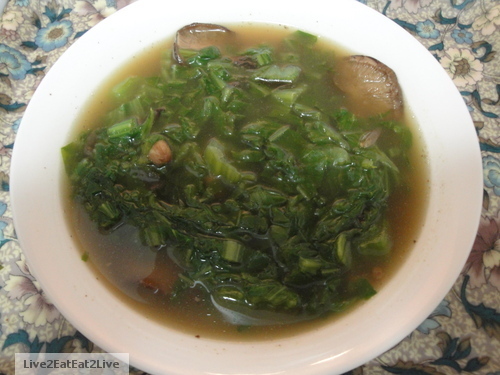 The broth was simply sugar and salt in water (the dried Shiitake mushrooms provided the “base”). Although shan yao will not be on our regular grocery list, it will be on our list for special occasions. I was glad to find it at our local market. During our last visit to China, we came across ku ding cha, or “bitter needle tea,” the ku is the same ku as ku gua (bitter melon). We bought a box from the tea merchant. Here is the Wikipedia article: http://en.wikipedia.org/wiki/Kuding_tea. 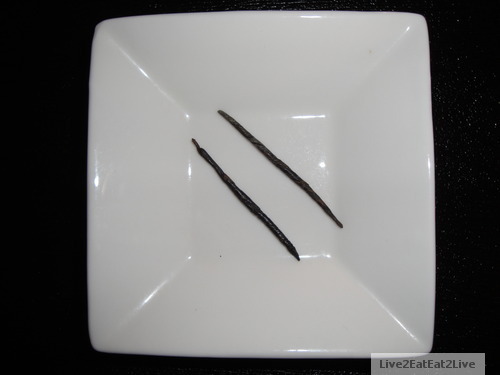 The tea merchant recommended using two needles for three to four infusions. The tea merchant warned us not to drink ku ding cha on an empty stomach. This is what the leaves look like after sitting in hot water for a few minutes. Our Qi Master friend said the tea is good for reducing cholesterol, washing toxins from the body, and lowering blood pressure (amongst other benefits). One of The Cat’s friends has been drinking ku ding cha on a regular basis and swears it helps his cholesterol and blood pressure. The taste is definitely an acquired taste. It is rather bitter. The taste is comparable to eating bitter melon. 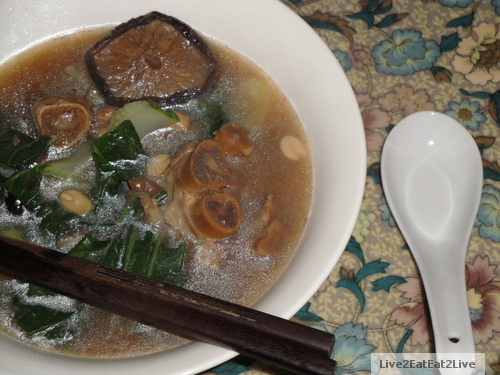 The difference with bitter melon and ku ding cha is that usually, the bitterness of the bitter melon is somewhat offset by cooking it with meat or seasoned with salt, sugar, herbs, or spices. The taste of ku ding cha is unadulterated. Since I like ku gua, the taste of ku ding cha is not an issue. There is a slight sweet aftertaste in the ku ding cha. 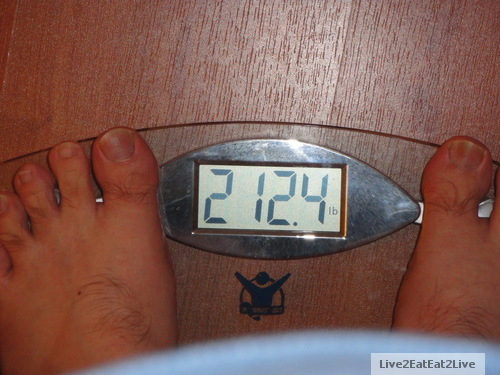 I’m not sure if the ku ding cha is contributing to my weight loss but this was my weight in mid-March. I would like to think the ku ding cha is contributing to healthier eating. I usually drink a couple of large cups throughout the day. 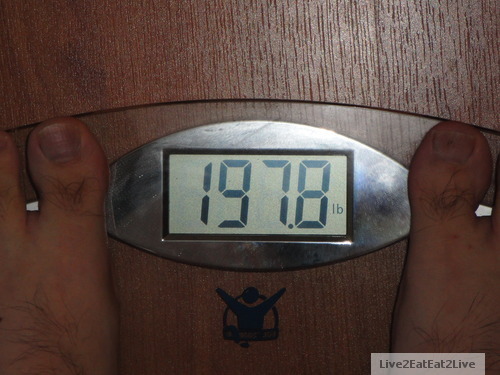 This is the first time I’ve weighed less than 200 pounds for a long time. After writing the previous post, I decided to make stuffed ku gua with the last bitter melon from The Cat’s friend. 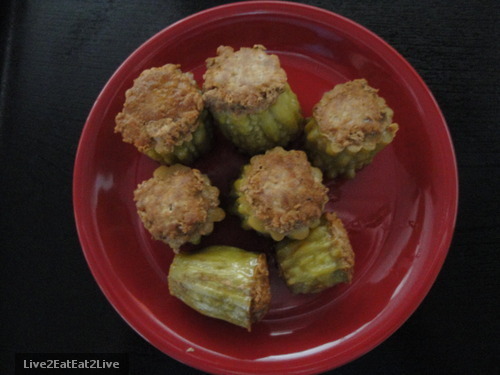 One of my father’s favorite dishes was stuffed ku gua. He didn’t make stuffed ku gua often, but when he did, it was an event. He like to mix the ground pork with fish cake. He would add dried mushrooms (reconstituted), water chestnuts, green onions, seasonings (salt, shoyu, etc) and an egg to the mix. 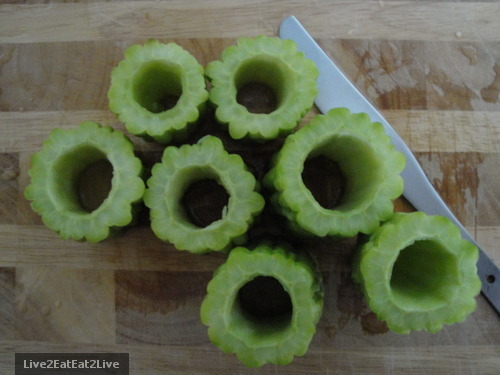 After preparing the ground pork stuffing, he would cut the bitter melon into sections. I would help him core the melon sections and stuff them. To cook the stuffed bitter melons, he would first brown both ends of each section to form a crust. He would then add water and Chinese fermented black beans and “steam” the bitter melon (similar to making potstickers). After the water and black beans evaporated a little, he would add a corn starch slurry to thicken the sauce. 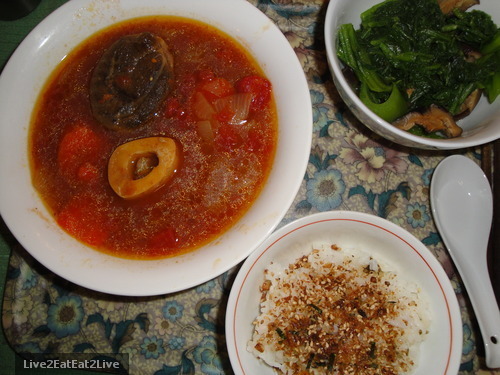 Since the dish is steamed, the ku gua tends to lose its color (turns yellowish). Because of this, stuffed ku gua is not The Cat’s favorite way to eat ku kua. But because we already had ku gua in a salad and stir-fried, The Cat said okay to do the stuffed bitter melon. I did not prepare the ground pork as complex as my father’s. I just added sugar, salt, Shao Xing wine, ground ginger, and an egg to the ground pork. For the steaming or braising liquid, I used dark shoyu and brown sugar. I skipped the corn starch. The stuffed ku gua came out close to what I remembered. Even The Cat didn’t mind the dish. The picture above doesn’t include the pan sauce. I didn’t want the sauce to obscure the stuffed ku gua. Here’s to all the fathers. Happy Father’s Day (a little early).